While the NHL has been on strike, hockey has carried on for everyone else. Whether you are a parent, a fan of minor league or amateur teams, hockey has continued as usual. In my case, I’m married to a hockey player. 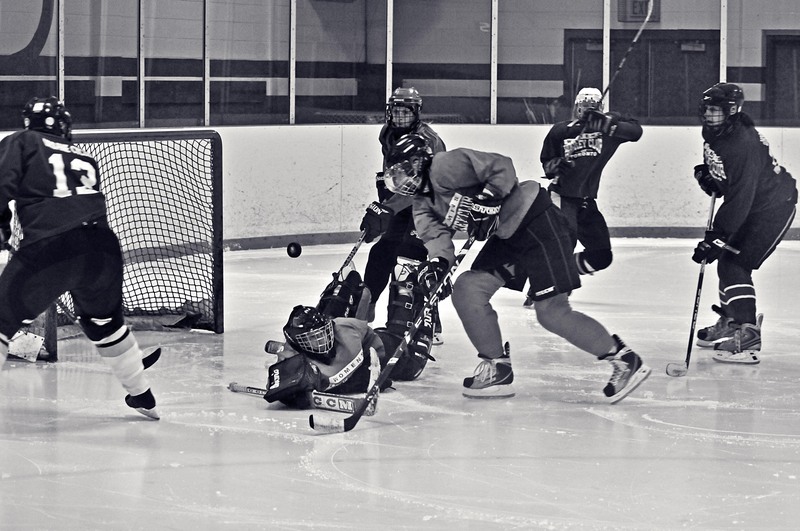 My wife plays every Saturday night in an all-women league here in Toronto out of Moss Park arena. And, of course, I get to take photographs. It’s a small arena, with little seating save for a small area near the entrance, which is away from the cold of the ice, but poor for taking photographs. This is where I hang out to warm my hands; otherwise I’m circling the rink, trying to find a good location where the glass is still clear. Up until recently, I would get behind the bench and take pictures from there. There is a little extra room behind the bench where I could pace and get a clear shot without any glass in the way. I just had to watch for errant sticks and the occasional sharp blade on my exposed toes. Eventually, they passed a rule not allowing anyone without a helmet to be on the bench and I’m not going to try and take photographs wearing a hockey helmet and mask. The lighting is usually pretty good and fairly even across the rink. I will pump the ISO up to 1600 or 2000 to get a reasonable shutter speed and enough depth of field. 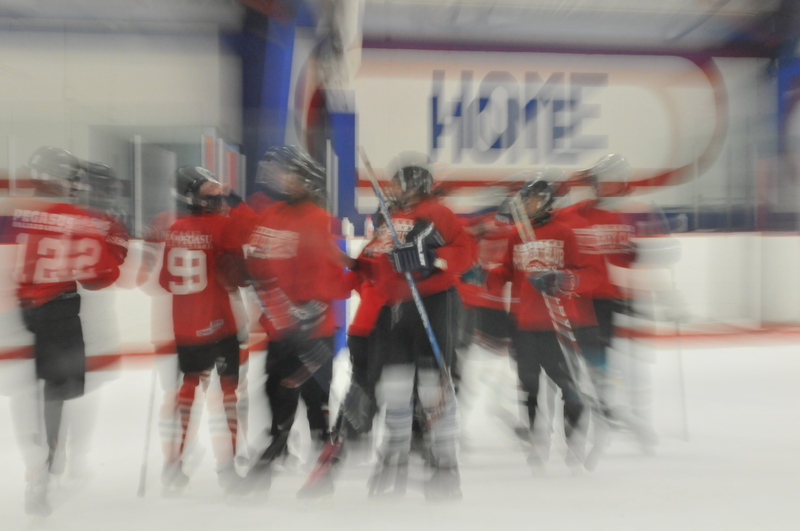 I set a custom white balance using the ice surface, especially if I’m shooting in JPEG mode. I shoot JPEGs if I think I need very fast frame rates without filling the buffer. Perhaps for a playoff game. Lately I’ve been shooting in RAW mode without any trouble. I shoot in manual, taking a few preliminary shots to get an exposure I like. 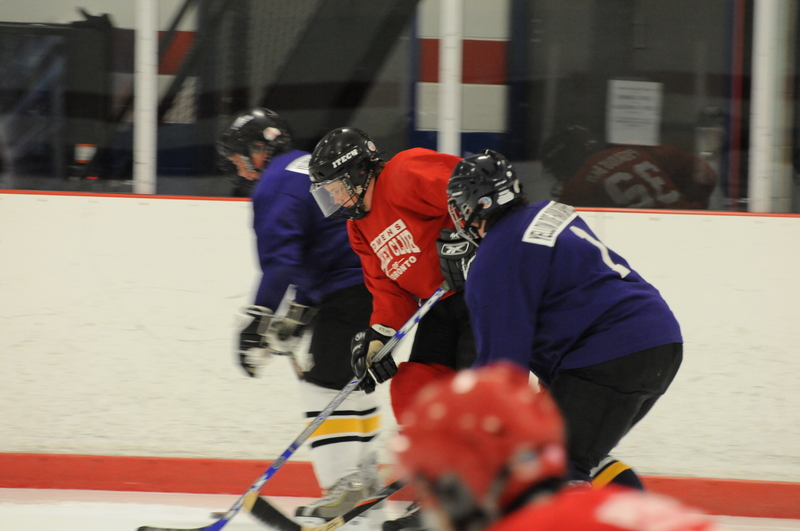 All that bright white ice can throw the exposure meter off, underexposing the players. And using compensation works for some photographs, but not all. As you change the amount of ice in a photograph, your exposure compensation has to change as well. Too much work. With manual, I pretty much can leave the exposure alone so long as the light doesn’t change regardless of the composition or zoom changes I make. Having an understanding of the game helps me anticipate what may happen, however at this level of play, anything can, and does happen, mostly to the enjoyment of the game by all. 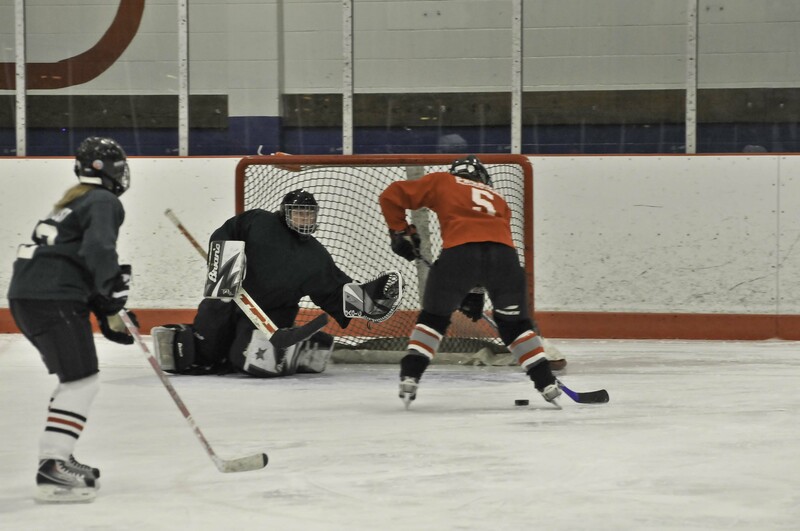 There is usually action around the net, so I will camp out either at the blue line looking in towards the net or on occasion, behind the net to one side to get players rushing in. Other times I will focus on a particular player and follow them around with my camera taking shots. This can create an interesting sequence. If the player is crossing in front of you, you can pan with them and get a great motion blur in the background. It would be interesting to put one of those mobile cameras onto one of the players, or the goalie and see what the video looks like. Perhaps that will be next year’s project. In the meantime, I would rather be at a game taking photographs than watching one on TV. This entry was posted in Event Photography, Sports Photography and tagged event photography, Hockey, low light photography, Moss Park, photography, sports, Toronto, winter photography. Bookmark the permalink.